Full bridge strain gauged load cells compatible with the LR Plus and EZ Series bench mounted materials testing machines. 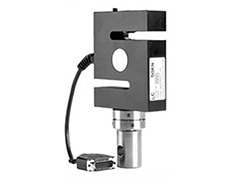 The XLC Series load cells have a 15-pin plug and mounting adapter. It fits below the main cell which should not be removed. Load cell value and sensitivity factors are stored in a memory device inside the load cell plug so the load cell is self-identifying. The XLC Series has within 0.5% of reading accuracy.